Now consider how many times you were told there was no evidence that Obama was born in Kenya and how anyone who questioned Obama’s birth was a racist. 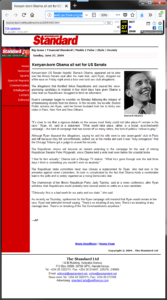 This is the evidence that is most self-evident, but during the 2008 Presidential race, didn’t Alan Keyes and other witnesses claim they remembered Obama saying in a debate with Keyes in 2004 that he was born in Kenya? Also, the African AP believed that Obama was born in Kenya. All this evidence doesn’t prove that Obama was born in Kenya. It doesn’t even prove that he was lying. It could be that Obama was told he was born in Kenya, just like he was told that his father was from Kenya, when in fact, his real father was Frank Marshall Davis, which explains just about everything, including the evasiveness surrounding his birth certificate and the suspicious death of the Hawaiian clerk who printed his birth certificate. Maybe the main thing being hidden was the father—not the country. All this evidence does prove that the media are covering up the fact that Obama was claiming as late as 2007 that he was born in Kenya, and that starting in 2012 or before, they are also covering up the evidence that his real father was Frank Marshall Davis. Although, we can’t expect most people to have known the truth about Obama given such unprecedented fabrication and cover up by the media, it should have at least been obvious to everyone in the world that the media were fabricating the Myth of Obama. It’s not about Obama. He is obviously just a front man. The real story here is how the media ignored every lead, and how self-righteous Obama voters were blissful in their ignorance, and hateful in their defense.